Labor Day weekend is the beginning of one of the best seasons in Idaho. The weather cools off, the crowds are gone, the mosquitoes are gone, and its easy to reach the higher elevations. What a great weekend for a long backpacking trip. Our plan consisted of a 4 day trip to complete a 31 mile loop on the Southwest side of the Sawtooth Mountains in Central Idaho. This is also one place in Southern Idaho not on fire. Our plan was to hike up the Little Queens River outside of Atlanta Idaho, cross over a saddle into Johnson Creek, hike up a fork of Johnson Creek, cross over into the big Queens River and loop back to the car. We completed this loop with a little extra, pushing the distance to 33 miles. Karyn wasn't able to attend, leaving myself, Doug, Lanette, Paul, and Gayle. We started out Friday morning hiking up the Little Queens River. 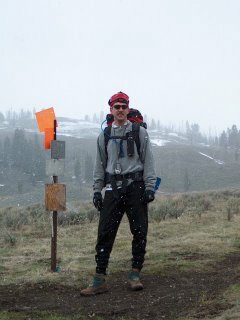 I was definitely appreciating the ultralight backpacking gear. My pack weighed in at 36 pounds instead of the 46 I carried last year. I even had an extra days worth of food. The Little Queens River trail climbs gently up the valley for 9 miles to the head of the canyon. We weren't on the trail long before we saw the first signs of bear. After about 8 miles we started looking for a suitable campsite. We reached the head of the canyon at 9 miles without a suitable camp site. We decided to take a 1 mile side trip into Brown's lake for the evening. Brown's Lake is a beautiful high mountain lake nestled against the Sawtooth granite backdrop. Just after setting up camp a thunderstorm rolled through, raining all evening. It was cool to watch the clouds, lower than the peaks, fly by overhead. The next morning presented clear sunny skies. We descended back down to the head of the canyon and hiked up and over the saddle into Johnson Creek. Johnson Creek burned a number of years ago. The descent down the canyon was difficult through the thick brush and over many downed trees. Just before arriving at our trail junction, I heard what I was reasonably sure was a group of wolves howling. The low howl started by a few as others join in and match the pitch. Way cool. We ate lunch at the stream crossing in the bottom of the canyon. My oatmeal breakfast didn't stick with me very long today. I ate a lot for lunch! After lunch we started up the tributary of Johnson Creek leading out of Pat's Lake. This was very brushy. We spooked up a number of deer. There were more signs of bear. Entering a marshy area below the lake we spooked up 10 more mule deer. I listened to the wind whistle through the dead trees. It made me question my wolf howl from earlier. Maybe it was just the wind? We will never know. After 7.5 miles of hiking, we arrived at Pat's Lake, our camp for the evening. At 8400 feet above sea level, this lake was also nestled into a granite bowl. Tonight the sky remained clear. It was a beautiful evening! The third day started like the others, beautiful sunshine. The hike took us past Arrowhead Lake and up to the saddle overlooking the big Queens River. The vista from their was amazing. We looked back down past Arrowhead Lake to Pat's lake, we could see far into the Sawtooth, and down the lush Queens River Valley. We didn't want to leave, but the trail beckoned. We descended steeply to the river. From here the trail follows the river all the way out. There were signs of bear, elk and deer in the valley. We spooked up some Spruce Grouse, Pine Grosbeaks, and many other birds. A Redtailed Hawk screeched overhead. This valley was much more lush than the little Queens. We hiked through a small burn, but most was rich green. We found a campsite after 7 miles of hiking, but we decided to go further. After 9 miles we started looking in earnest. At 10 we found a questionable site, but decided to hike on. It was all downhill. At 12 miles we were getting pretty tired and would take anything. We found a little spot that would work. While clouds had threatened earlier in the day, it was a clear evening. I decided to leave the rain fly off one end of the tent so that I could sleep under the stars. They were outstanding. The half moon rose a little after midnight. Since we hiked most of the trail on Sunday, we only had 3.5 miles left to hike out. It was fairly uneventful except for the fresh Cougar track. We finished the 33 miles loop and only saw 2 people. They were camped at Brown's lake where we stayed on the first day. Amazing. We stopped in for lunch in Atlanta. Unfortunately this mining town doesn't have a restaurant. I guess it would be backpacker food for another meal before driving the 66 mile gravel road out of there. This is definitely a place I would recommend and will likely return to again. We were already discussing various other options in the area for the future. Shorter loops with some off trail connections, or longer loops beyond the head of the big Queens River. Beautiful country, lots of wildlife, no people. Don't tell! Great post. Have you heard Josh Ritter's song "Idaho" it fits your trip perfectly. Looks like a good time. Last time I was there on the little queens loop we got convinced to bring horses--they got lost and we slept at Pat's Lake without any gear. That night the lake froze over! I will never backpack and let ANYTHING carry my gear. Woodyburys Four - That sounds like quite an unfortunate experience. You should investigate ultralight backpacking. Less weight reduces the need for stubborn animals to carry it. Thank you for your excellent post. Last summer (July 2008) I followed your route up the Little Queens, via Browns Lake, Pat's Lake, and the Pat's Lake divide, but rather than finish the loop when I reached the Queens River, I continued to cross the Sawtooths and came out at Petit Lake. The one thing I would emphasize is how difficult the hike is between the divide above Browns Lake and Pat's Lake. When I did this hike as a kid 30 years ago the trail was in wonderful shape. The fire in the Johnson Creek drainage has nearly erased the trail in a number of spots, and the brush (just as you describe it) has completely overtopped the trail. The Forest Service has badly neglected the trail and has done little to nothing to restore it to its pre-fire days. Anyone planning this loop should allow for ample time to thrash through the brush, and should definitely plan NOT to camp anywhere in the Johnson Creek drainage, since it still has thousands of potential deadfalls that DO break loose on windy days. By contast, the pass over Pat's Lake divide (beginning at Pat's lake and going to the Queens River trail) is a wonderful trail, still in good shape, with some of the most picturesque views you will see anywhere. Anonymous, thanks for the update. It sounds like Johnson creek is even more overgrown than last year. My son & I recently took the Little Queen's River hike. We came up to the first bridge, then the second, and then when we needed the third, alas, there wasn't one. How is one to cross? We went two-three miles up the river until finally a tree was found to cross. Upon finding the trail, we were hindered by downed trees and debris for the next five-six miles, rendering complications to reach the lake. Our time was limited, so with that said, perhaps we will make it to our desired destination by allowing far more time. Question that kept coming to our minds was: Why doesn't the Forest Service clear out / clean up, even if just a bit? since it was slightly downhill all the way back to the trail head. I still have my heart set on seeing Brown's and Scenic lake.